The Visit Nacogdoches staff, along with the Nacogdoches Quilters Guild and our local chamber of commerce, invites you to discover and experience a new and exciting development in our area - the Pineywoods Barn Quilt Trail. Barn quilting first began in the 1980s when people in the Midwest began creating and displaying wooden quilting squares on their barns as decorations. 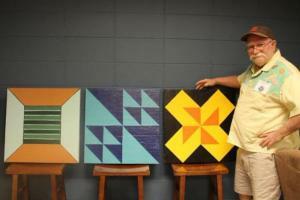 Much like traditional quilt patches, the squares were created from simple patterns. After the trend began to catch momentum, a trail was formed connecting the various display locations and included quilts placed also on homes, businesses, fences and mailboxes. The trail attracted a variety of visitors to the region who desired to view the different designs. The Pineywoods Barn Quilt Trail is our own region&apos;s piece of barn quilt Americana, and we&apos;re so excited to share it with you. Our trail includes quilts that are created from either wooden or metal pieces that have been adorned with colorful and unique patterns such as the ones shown above. Each quilt represents something different, and we invite you to explore our area to view them all. Our trail is a work in progress as we&apos;re still generating interest and registering new display locations. Stay tuned - we expect to have many additional quilts added in the near future. 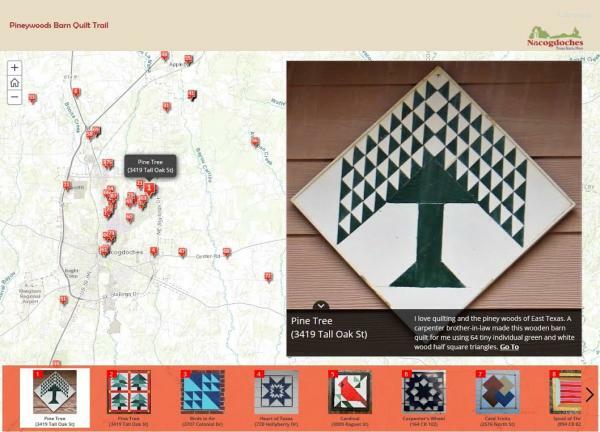 Click on the image below to view the Pineywoods Barn Quilt Trail online map. Once you open the map, click on any flagged location to open Google Maps for directions. Please note: We are continuously adding new stops to the trail as they are received. If you live in the Pineywoods region and would like to create your own barn quilt to be displayed on our trail list, we invite you to read the requirements below and register as soon as possible. Get creative! After you decide on a design, paint it on either wood or metal (size can range anywhere from 1 to 8-foot squares depending on site) and attach it to a barn, home, business, fence or freestanding frame. (If you&apos;re a local business owner, consider displaying the quilt in your shop to draw in more business.) Not the best painter? No worries. A photo of a quilt pattern can be printed on vinyl with an adhesive back and attached to metal. Register your quilt with the Pineywoods Barn Quilt Trail by contacting Stephanie Fontenot at Stephanie@VisitNacogdoches.org or (936) 564-7351. Be sure to include the name of your quilt block pattern, the address where it can be seen, a high-resolution photo showing the quilt after it&apos;s been hung as well as a two-sentence description of how your piece came to be. Need help creating your quilt? Order locally from Loblolly Quiltworks or Pop Images.